Skagway is charming. It reminded me of the fictional town of Storybrooke on the television show, Once Upon a Time. It's so darn cute and filled with more things than we had time to do. On our previous Alaska cruise, Skagway was not one of ports, we visited Sitka instead. Sitka was lovely, but if you're planning a cruise, I highly recommend picking an itinerary that includes Skagway. Our Ruby Princess Skagway picture, with a bald eagle and a fisherman. Pictures right off of the dock. Skagway was important during the late 1800's, as prospectors traveled through to Canada for the Klondike Gold Rush in the Yukon. The town grew and built a notoriety for lawlessness and immoral behavior. John W. Nordstrom spent a few years in Skagway, before settling in Seattle to start his shoe business, which would grow into the Nordstrom retail empire. We had several hours before our afternoon excursion, so without a plan, we set out to explore the town. We took a lot of pictures. Sugar Mamas sells cupcakes and hot dogs. On the recommendation of the employees, I tried a rhubarb cupcake. I think it may have been the first time that I've ever eaten rhubarb in any form. It was delicious. One of the must-see attractions in Skagway is The Days of 98' Show. We saw this as an optional excursion, but did not pre-book it. We were drawn in by the ticket sellers on the street, promising a family-friendly, fun show. Tickets were twenty-five for adults and twelve fifty for kids for the hour long show. When we shelled out the money, we thought it was a little steep, but we were also in vacation spending mode. That said, the show was worth every penny. It was one of my favorite things that we did on our vacation. It was highly entertaining and we all loved it. The show is about Soapy Smith (Bill McCarthy), a con-man who lived in Skagway during the late 1800's. The show has been running continuously since 1923, when steamships first started bringing tourists to Skagway. The Days of 98' Show is a musical- comedy with a dose of local History. It is very audience participatory. Your chances of being pulled on stage are fairly high, especially when the theater isn't full. It was about half-full during our performance. Don't think that you can hide in the back either, they will find you. Normally, this would scare me off, but I actually had a lot of fun when I was pulled on stage to dance the can-can. I thought I did pretty well considering I was bundled up in cold-weather clothes and I was in pain from sciatica. The best part of the video is hearing Dan and the kids laughing. After the show. we ate lunch in The Red Onion Saloon: a former brothel. We didn't do it with the kids, but they have tours of the brothel. The restaurant has a lot of character and it was jammed with tourists. The food was good, but I think the ambiance is really what sells the place. It was like being in an episode of Deadwood. If you're traveling with children, you must stop by The Trail Center: Klondike Gold Rush International Historical Park. The Trail Center offers interactive educational exhibits geared towards children, explaining life during the Klondike Gold Rush. It's small (we spent about thirty minutes) and it's free. Zoe and Felix are from Sweden, so they were unfamiliar with this part of North American history, that I had learned at their age. Dan and I each took a kid and went through the exhibits. It's very well done and worth doing. When they finished, they were given a short quiz by a park ranger and earned a National Historical Park pin and sticker. I had no idea that this was a thing with our National Parks, but it's a wonderful way to teach kids. It's fun and interesting. Heck, even if you're not traveling with kids, it's worth popping in to take a look. In Skagway: Part Two, our excursion to an Iditarod training camp and husky puppies! Our first port was Juneau, Alaska's capital city. It's Alaska's second biggest city with just over thirty-two thousand people. This isn't a very big city, but it certainly gets crowded with tourists during cruise season. Here are pictures that we took as the Ruby Princess was docking at the port. Parked next to the Ruby Princess, was Holland America's Nieuw Amsterdam, which Dan and I took on our first trip to Alaska. The Nieuw Amsterdam is a great ship, perfect for older passengers. It's much smaller with more quiet spaces. The Ruby Princess is a better fit for cruising with children. The official Juneau port picture, with a anemic looking killer whale and dopey moose. I like the framing with the bear, who looks like he wants to get in on the action. We took a picture of the kids with the statue of Patsy Ann, Juneau's famous rescue dog. If you look up in the sky and are lucky, you'll spot bald eagles soaring over Juneau. They are gorgeous and majestic. However, if you fail to spot a bald eagle, you'll most certainly see the Alaska Ravens. Alaska Ravens are everywhere in Juneau. They own the place. They have zero fear of tourists. We had a few hours to browse shops and grab lunch before our afternoon excursion. We ate at the Alaska Fish & Chips Company. The food and service were both very good, but this airplane themed restaurant is most definitely a tourist spot, complete with tourist pricing. The restaurant is located on the waterfront, in a small mall of other business. We walked through the mall and looked at all manner of Alaska souvenir: canned salmon, fur bikinis, and enormous hunting knives. We declined those purchase opportunities. Instead, we took pictures of fun signs and the town. Juneau is a port that is filled with great excursions. 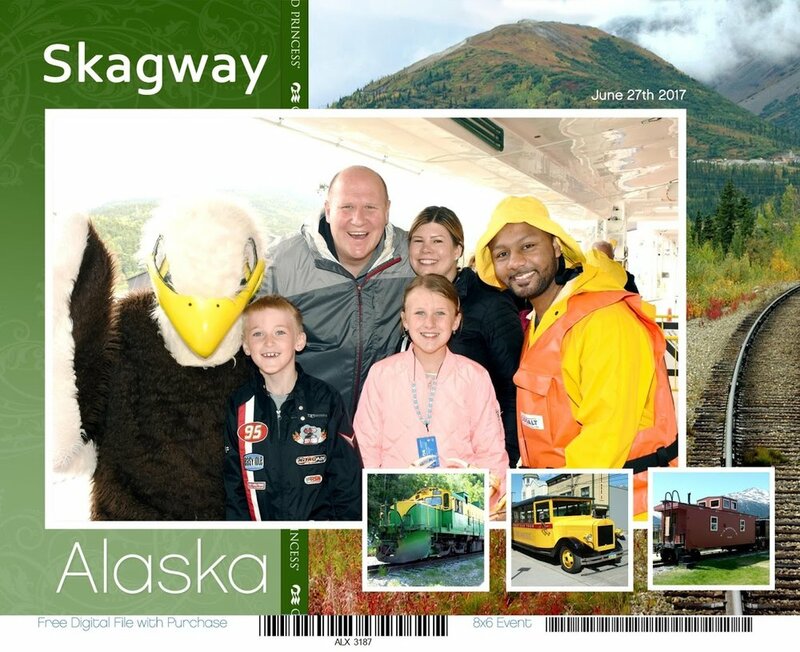 On our first cruise, Dan and I took a trip to an eagle rescue, went on a cable car ride, and rode in a float plane over the Tongass National Forest. This trip, we booked the "Mendenhall Glacier Float Trip." We were picked up at the port and took a quick bus ride to the start of our rafting adventure. We were told to wear thick socks and warm clothes, with the tour company outfitting us in safety equipment, rain boots, and water-proof clothes. Bundled up, armed with paddles, we waddled to our raft and we were helped aboard by the rafting crew. I can't remember the name of our guide, but she was great. She made sure that we were safe (no going overboard), but still had fun, while learning about Alaska. The kids were allowed to paddle, but really it was the adults doing the bulk of the work. It wasn't too strenuous though, this is an excursion that most people would have no problem enjoying. If you really couldn't or didn't want to paddle, you were put in the middle of the raft. No pressure to get a work-out! This is the Mendenhall Glacier right in front of us! The best part of the trip was the small section of rapids. It was thrilling and it definitely made me eager to book a white-water rafting vacation. Most of the excursion was tame, just floating through the Tongass National Forest. It started lightly raining and it was so cold, that the rain turned to ice in our hair. If you look closely, you can see the ice! This was actually our 2017 holiday card picture. Not only did we have a great time, but we really enjoyed spending the afternoon with the other people on our raft. Everyone was very friendly and having fun. Before heading back to the bus, we were given hot cider and a selection of appetizers- including a salmon spread for crackers, of course. You can't escape salmon in Alaska. If you're looking for a Juneau excursion that is a little thrilling, without being terrifying, the "Mendenhall Glacier Float Trip" is the perfect pick. The Ruby Princess has a large range of food options; truly something for everyone. Like many cruise lines, some of the dining options are including in your fare, such as meals in the main dining room, the casual buffet on the Lido deck, and a few quick service options. There are also a handful of specialty restaurants that you can enjoy for a nominal fee. It's recommended that you prebook the speciality dining restaurants prior to your vacation, as these are smaller dining rooms and can filled to capacity, especially on sea days. We imagined that our trip with the kids would not include the speciality restaurants, so we did not make any reservations. However, on the very first night, we decided to splash-out at the steak restaurant, Crown Grill. The first night of a cruise is one of the slowest for specialty dining, so we were easily accommodated and the restaurant was practically empty. Felix is a bit of a finicky eater, but the staff at Crown Grill was awesome. They ran to another restaurant on the ship to get a big plate of pasta shells and cheese. Felix was thrilled. The rest of us enjoyed steak and seafood. The dessert sampler was divine. It was easily the best meal that we ate on the Ruby Princess and had we been able to secure another reservation, we would have returned. Based on all of my past cruises, I definitely recommend trying the specialty restaurants. They are usually worth paying a little extra. Although we didn't have a chance to dine in them, we did take a look at the other speciality dining offerings onboard. I was most intrigued by celebrity chef Curtis Stone's Share, which offers a six-course meal. Adigo is the Italian offering and I suspect this is where Felix's shells and cheese was procured. The Salty Dog is the Gastropub option. We had the late seating in the Da Vinci Dining Room. I always find it difficult to choose between the early and late seating, but since we were a late booking ( only a handful of available cabins when we booked), we were not given a choice. As far as cruise ships go, the offerings in the main dining room were about average. When we were on a two-week cruise, we found the main dining room choices to get a little same-y, but a week is just enough to enjoy it, without getting board. The dining room staff certainly works very hard ( as does everyone on the ship), but the meals always feels rushed. I think more than that, the stress from the servers trickles over. I noticed this on previous cruises. They try very hard to maintain an air of calm, but the whole meal feels somewhat tense. There are several main dining rooms and although we were assigned to Da Vinci for dinner, breakfast and lunch were unassigned. I'm going to close with this cute picture of Felix talking to the captain of the Ruby Princess on one of the formal nights. Coming next, my port and excursion review of Alaska's capital, Juneau.